2017 pet retail earnings in the US totaled $69.36 billion, up $2.61 billion over 2016. Consumers spent about 11.3% of those dollars online. Internet marketing’s impact on brick-and-mortar store sales is difficult to measure, but approximately 80% of consumers research products online before buying them. The majority of those consumers recently shifted from the Boomer generation to the Millennial as the number of young pet owners jumped to 35% of the total. Millennials are the most likely age demographic to shop online and the most likely to use social media in making buying choices. We want to follow where consumers spend their time and as online marketing channels, such as Instagram, Google, and Amazon play a bigger role in the shopping behavior of the country’s 84.6 million pet consumers. Millennials now compose the majority of pet owners. They are also influence the buying habits of older age demographics, i.e. parents. Quality content engages buyers at all levels of the funnel to drive engagement. Email marketing remains the most effective and cost-efficient channel for brands to see a positive ROI. Instagram, is increasingly helpful to reaching Millennial buyers. Paid ads and brand pages are inadequate strategies without social media content support. 55% of shopping trips begin at Amazon, and with the online retail giant’s massive push of Alexa this will continue to increase its influence on customer shopping behavior [source]. Google, the world’s largest search engine, remains the go-to spot for general searches since it hosts 63.4% of US searches [source]. Baby Boomers were the first generation to elevate pets to the status of family members, but Millennials have outpaced Boomers and now make up 35% of American pet owners [source]. How will that generational ownership transition influence the way ecommerce pet brands market and sell their products? Millennials are changing the face of shopping, by their habits. Though not as wealthy as previous American generations were at their age [source], Millennials have reconceived the ideal buying experience, and they are influencing their parents and grandparents to do the same. Millennials are four times more likely to shop online than Boomers, for example [source]. And they are more motivated by price than their parents were [source]. In short, Millennials are increasingly the largest segment for pet brands doing online commerce. But their online buying behavior may be different than expected. According to Forbes, “About a third of millennials make the majority of their purchases on a desktop computer. Only 16% of millennials make the majority of their purchases on a mobile device.” What we have seen among our clients is more than 40% of ecommerce pet purchases in 2017 were on a mobile device. All of them are using the internet to do research regardless of the point-of-sale location they choose [source]. As the largest ecommerce buyers, Millennials are also the most likely to consider their values when they make a purchase. These values include saving money, brand authenticity, local sourcing, ethical production, and a positive shopping experience [source]. What researchers can’t quantify is how much influence online marketing has on Boomer and Senior purchase choices[source]. Older generations may not be as rabid online buyers, but the internet is still part of their buying journey. For instance, if Grandma wants to purchase a new litter box for her cats, she contacts her college-age granddaughter to ask for an opinion. The granddaughter goes online to search out and analyze the various ecommerce options for litter boxes. Finally, she texts her top selections to Grandma -- who promptly goes to Amazon to buy the recommended product [source]. That’s only one example of why brick-and-mortar isn’t dying in the digital age. While not surging as quickly as online sales, stores with physical space continue to ramp up their revenue [source]. They aren’t doing it on a traditional strategy, however. Successful stores are no longer four walls with product-stuffed shelves inside. Instead, they are positioning themselves to capture online researchers with engaging in store experiences. Annual revenue for pet products has increased from 2010 to 2016 on all channels except veterinary offices and discount stores. Still, online purchases have grown the fastest [source]. Online destinations now receive 11.3% of the $69.36 billion dollars Americans spend on pet supplies in a single year [source]. We are seeing that trend among our pet retail clients in 2017, with 40% of consumers who bought pet products were under the age of 35. They accounted for 37% of revenue on average which was a 15% increase from 2016. Social psychologists expect the number of young pet product purchasers to increase because marriage and childbirth numbers are down among Millennials. Many young people seek the companionship of a pet in the absence of a life partner or child. They treat the pet more as a family member than as an animal, and this behavior shows up in increased expenditure on luxury pet products [source]. 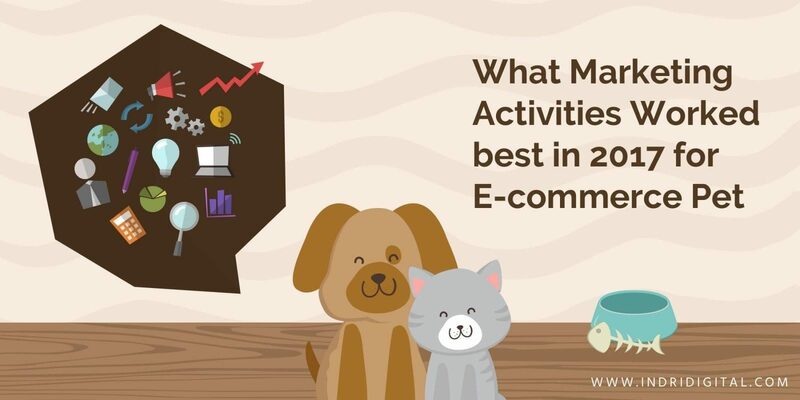 With Millennials making up 35% of pet owners, 11.3% of pet products being sold online [source], ecommerce now accounting for more than 12% of retail purchases generally [source], and Millennials making 54% of their purchases electronically [source] -- what lessons does 2017 hold for ecommerce pet retailers? Engaging online browsers with relevant, interesting, and actionable content is still a great strategy. According to Lemonstand, content marketing increases conversion rates by almost six times, from 0.5% to 2.9% [source]. But conversion rates alone don’t tell the whole story. Content also ramps up social media mentions and creates a buzz through word-of-mouth marketing. That’s critical because 52% of Boomers and 82% of Millennials name word-of-mouth recommendations as their most trusted source for buying decisions [source]. Content exposes the brand to the customer, creates positive consumer experiences, and enhances buyers’ trust in the brand. Plus, the sheer size of the online retail behemoths like Amazon, e-bay, and Wal-Mart means small ecommerce pet brands need to target a specific audience, build a community, delight customers, and create a sense of brand ownership [source]. An online luxury pet product retailer launched its blog in early 2017. The average duration of a visitor’s time spent on their website increased by 5%. For its content, the company created two educational or informational blog posts per week, which it then disseminated through email campaigns and social media posts on Facebook and Twitter. In the internet’s youth, retailers grew concerned that online shopping was a buying experience not a browsing experience. Those retailers that relied on emotionally driven impulse purchases feared the loss of that revenue since e-commerce buyers could demand made-to-order merchandise at affordable prices while bypassing the impulse bins [source]. Those retailers’ fears were not unfounded. But they didn’t count on innovative e-store structures and the advent of mobile devices, which created a whole new browsing experience. Now, shoppers browse in two-minute spurts using their phone or other hand-held device [source]. Many prospective buyers may be browsing with a mobile device and later buying from their desktop, which offers a larger screen and easier purchase experience [source]. Others are combing through merchandise in brick-and-mortar stores before making a purchase online [source]. Both behaviors indicate that the internet offers a robust browse-and-buy experience, but they also reinforce the nearly 70% cart abandonment rate that continues to frustrate retail executives [source]. We know for sure that reducing page load time can drastically impact cart abandonment. A study by Radware showed that a two second delay in load time ramped up cart abandonment rates by 20%[source]. The 2017 page load experience for a high-end, luxury pet product retailer in the Northeast is instructive. Their average page load time was 3.89 seconds. Bringing the time down to that number required switching from Shopify to a Magento site. The marketing team needed to add additional plugins for international customers, and they discovered that speed became a challenge with Shopify. The plugins made the site work slower overall, though times varied heavily week-by-week because of Shopify’s servers. Integrating efforts across all customer channels is critical to ecommerce success. Consistently communicating a singular message across multiple channels boosts sales and lifts ROI. Our luxury pet brand created an optimized content strategy and integrated it across channels through paid ads, SEO work, emails, and organic social media posts. The company also experimented with press releases and features in magazines such as Forbes, the New York Times, and apartment therapy. The company also used Amazon as a media platform to create awareness and drive sales for these products. Their team underpinned these marketing efforts with outstanding customer service. Email may be the internet’s oldest marketing strategy, but it remains the most effective and efficient one. In an era of rising costs and competition on social media, some ecommerce pet retailers are focusing more sharply on email. Despite the long-heralded claim that email is dead, the data shows it is as alive as ever. After all, 91% of email users check their accounts first thing in the morning. Plus, email boasts an average open rate of 21.73% across all industries and an average click through rate of 3.57% [source]. Email and social media marketing work better together [source]. While social media sites fill the top of the sales funnel, email remains the go-to channel for lead nurturing. 66% of online buyers claim to have made a purchase in response to an email campaign [source]. When our Brooklyn-based pet product retailer crafted a new article for their blog, they also shared it with their extensive email list, added it to their queue on Facebook, and shared with their audience on Twitter. Their content was integrated across all their marketing channels with email taking the lead position. Social media sites like Instagram and Facebook are effective platforms for engagement, content sharing, and reaching Millennials. Though increasingly expensive, social media marketing is also more and more necessary for brand recognition and connection. Around the world, 2.8 billion users are on social media. The largest non-Chinese platforms are Facebook, YouTube, Instagram, and Twitter [source]. Almost 60% of content shares happen on Facebook followed by the 18% that occur on Twitter [source]. It’s Instagram, however, that has attracted Millennials, the largest demographic of pet owners [source]. But paid ads and owned pages on social media aren’t enough. Brands marketing on Facebook and Instagram have access to a mammoth audience, but owned pages get lost in the clamor and paid ads are expensive. More than 95% of Millennials follow a brand online, but 96% of all users that discuss a brand do not follow that brand’s owned page. What does that mean for marketers? Customers have to carry your message to their own social media pages. To do this, our luxury pet retailer sponsored give aways and contests using the refer-a-friend concept. Entering to win a valuable product required customers to share content with someone they knew. The company used their social media pages to share interesting blog posts, inspirational animal stories, or news about the pet world. These stories weren’t tied to the company’s products but were believed to be helpful to their audience. This approach created engagement and conversation around relevant pet-related subjects. Facebook influences well over half of online and offline buying decisions, but it performs poorly at generating an emotional response [source]. The platform is unsurpassed at putting a clean, clear message in front of a target audience to generate discussion, but marketers are looking elsewhere to deliver emotional content. Instagram is the social media site attracting their attention. Its pre-follower engagement rate is 58 times higher than Facebook’s. Plus, 90% of the platform’s users are under age 35, meaning Instagram is the preferred online social hub for all those pet-owning, e-buying Millennials. Better still, more than half of Instagrammers are active on the site every day [source], and 80% are following at least one brand. Plus, 75% will take action after seeing an advertisement on Instagram [source]. With US-based Instagram users expected to top 100 million in 2018, it’s easy to see why 48% of American businesses have joined the platform. Keeping up with an Instagram account is challenging. Because of how interactive the platform is, our luxury pet retailer found that staying on top of new releases could eat up the marketing team’s time. Moreover, Instagrammers’ preferred content type changes rapidly. In 2017, video was king. This prompted our pet retailer to urge their customers to upload their own photos showing pets who were actively using the products. Email and social media can drive traffic to your site, but shopping begins at Amazon. Pet ecommerce brands have no choice but to use Amazon even if their goal is to expand sales on their own websites or other online sales portals. After all, 55% of shopping trips begin at Amazon [source]. Our luxury pet e-commerce retailer reported that 55% of its total quantity sold last year passed through Amazon. Some online retailers are finding that a multi-channel checkout that includes Amazon as well as their own websites and other retail spaces offers the greatest ROI. Others, however, are choosing an Amazon-only strategy [source]. Whatever approach retail brands choose, they cannot ignore the presence and power of Amazon, especially since it has started to nudge Google for a slice of the search pie. Google, the world’s largest search engine, remains the go-to spot for product searches since it hosts 68.75% of global searches, and its closest competitor is a Chinese search engine. [source] Google pioneered the concept of ranking ads by quality, essentially making the most clickable ads visible over and over. Facebook, Amazon, and others innovated on this concept [source]. With Amazon snapping at its heels, Google then made paid ads visible in image search results [source]. Since 2016, Google has given users the ability to personalize the ads they receive. Experts expect personalization to deepen both through the search engine’s ever-changing algorithms and through marketers’ skill [source]. The algorithms work on their own. But the marketing team scales up the results from there. Google is even offering advanced personalization, which uses machine learning. It can determine if you are a woman who clicks on green ads or a man who likes blue. While most small and mid-sized pet retailers lack adequate data for that, it is the future of search. By partnering with Target in late 2017, Google showed its intention to pursue linking voice search to ecommerce. Customers can use Google Assistant to voice shop at Target, which then delivers the product through Google Express. The search engine will be able to personalize results for voice shoppers who buy through Target [source]. Gartner’s research says that web users will perform 30% of their searches without a screen by the year 2020. With personalization and voice search increasing, what does that mean for ecommerce pet retailers? According to our online pet retailer in Brooklyn, marketers will need to optimize their pet product retailer’s Amazon listings for voice, which will be very different than what than current optimization strategies. Right now, Amazon marketers are optimizing for typed query strings because a voice search doesn’t provide a full list. Amazon filters voice results. 2017 was a banner year for pet ecommerce retailers. Changes in buyer demographics, customer expectations, and buying experiences underscore the critical role of content marketing and online brand development. What has caused the pet retail industry to grow each year for more than 20 years? What does a future of growth look like? Online shopping is growing. How is that growth affecting independent pet retailers? The internet is changing the way people buy pet food, not just online but in stores with physical space as well. Who owns pets? What do pet owners think about their pets? What products do they purchase for the animals? An extensive study of consumer shopping habits in 2017. Projections about the ramifications of the internet’s influence on the entire retail industry.